In recent years a lot of players have realised they can improve their game by using a shorter hurley. Those coaching younger players have now recognised the importance of the stick being in proportion to the player's size. There are countless numbers of redundant or unused hurling sticks gathering dust in clubs, schools, garages and elsewhere which could be modified and passed down to younger players. With the present economic climate and the imminent problems in the supply of ash, this invention provides a simple, quick and inexpensive method of shortening hurleys. 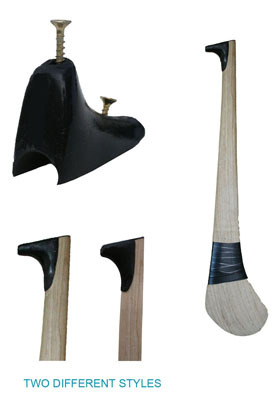 The "BlackTop" is a moulded polyurethane device shaped and formed to replicate the top handle section of a hurling stick. It incorporates a semi-circular channel to provide rigidity when fitted to the hurley. The sidewalls of the channel are designed to be flexible enough to accomodate the variations in thickness of different sizes and types of sticks. provided, then cut off the excess wood (or other material) as shown below. No Pilot holes required - Ensure all screws are screwed in flush - In larger BlackTop the long screw should be countersunk in 6mm from top of hole. BlackTop can be "rubbed in" with sandpaper, if required. Handle grip applied as usual.